Welcome to our brand new, renovated condo featuring new carpeting in all three bedrooms as well as new ceramic tile in the hallway, kitchen, and bathrooms. New Pergo flooring has also been installed in the living and dining area, do not worry about stains and spills. 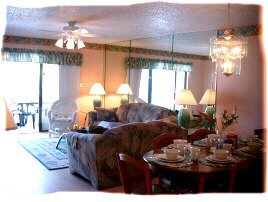 All rooms have lots of light and ceiling fans. 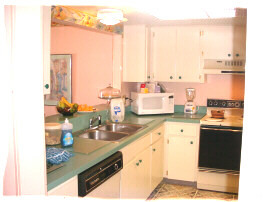 You also have the convenience of a washer and dryer right inside the unit. The dining area seats 6 comfortably and has a wet bar for your convenience. Pets are NOT allowed, No Smoking. The large living area is comfortably furnished with a picture window leading to the large balcony, overlooking the ocean, the pool, the hot tub, the tennis court, the playground, and the barbecue/picnic area. Location: Indian Rocks Beach, Clearwater/St. 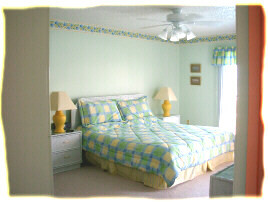 Your master bedroom has a beautiful ocean view and access to the balcony. A comfortable king-size bed awaits you, and you are provided with a large walk-in closet and an en suite bathroom with double shower. Bedroom number two has two twin-size beds and a large closet, situated right beside the main bathroom. Bedroom number three has a queen-size bed and a smaller closet. The main bathroom has a shower/bathtub. 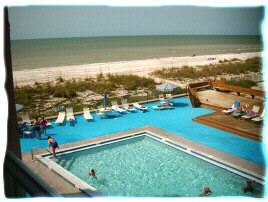 We even provide your linens (sheets, towels and blankets) - all you really need is your bathing suit and your sun screen. The sunshine is FREE! Your kitchen has all the conveniences of home, including oven, refrigerator with ice maker, dishwasher, microwave, toaster, coffee maker, and even a blender to make those cool drinks for hot days. All new dishes, glasses, cutlery, and cookware are waiting for you. Privately owned and reserved parking right underneath the building (always in the shade). Other activities/entertainment: 90 minutes from Orlando, Salvadore Dali Museum, Bush Gardens, Tampa Bay Downs (horse races), Tampa Stadium, Museum of Fine Arts, Sponge Docks, Clearwater Marine Science Center, Sunken Gardens (Botanical Garden), Parasailing, Jet-Skiing and much much more. If you don't feel like cooking, you are surrounded by many nice restaurants of different tastes and prices. From fast food and take out to five star cuisine. For the Year 2001: Rates are From $700.00 to $1,200.00 per week. For the Year 2002: Rates are From $750.00 to $1,200.00 per week.